Dr Peter Klaassen, Craigmore’s General Manager for Sheep, Beef and Horticulture (pictured), has been helping co-ordinate the reseeding of farmland in the Landsdowne Valley, Port Hills, following the fires which burnt large areas of the hills behind Christchurch in February. To read the full article please see below, or visit this link at Christchurch City Council’s website. Watch this news clip from TVNZ on the re-seeding. 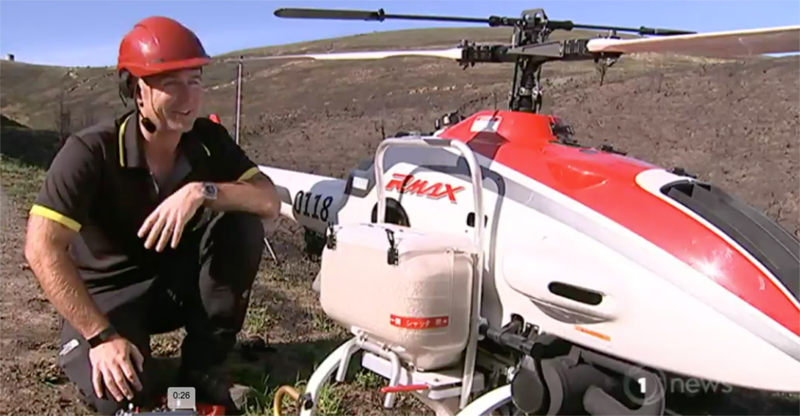 A group of land owners hit by the Port Hills fire have pioneered a New Zealand first – using a drone to spread grass seed as they begin the mammoth task of reseeding their land. The 17 landowners in the Lansdowne Valley area pooled resources after the fire to buy bulk seed and fertiliser, and have used a combination of a helicopter and drone to reseed 450 hectares. Dr Peter Klaassen, General Manager for the New Zealand-owned rural investment manager Craigmore Sustainables, helped the group navigate through the reseeding process, and co-ordinated the aerial sowing. (University) and my background in farming, I offered to help co-ordinate it. It’s meant a fair few phone calls, organising the seeds, pulling together what was needed, and mapping from Council. Dr Klaassen said by pooling together the group had been able to buy bulk seed and get expert advice. The reseeding operation began on Friday and continued through the weekend. Geoff Lamb from Yamaha Motor, the company that owns the drones, said the reseeding had been an excellent opportunity to trial a drone reseeding small land lots. The drone is fitted with a box on each side, and it can carry up to 15 kilograms of seed each time. The person controlling the drone can control when the box starts releasing seeds, and a tracking map is used to ensure even coverage. A full Port Hills fire recovery plan is being worked on by recovery managers Murray Sinclair and Al Lawn with staff from both Christchurch City Council and Selwyn District Council and input from local iwi, ECAN and other agencies. The plan is due to be finalised in the coming weeks.